I posted earlier this month about my estimate of shoes for the training and race at Boston. 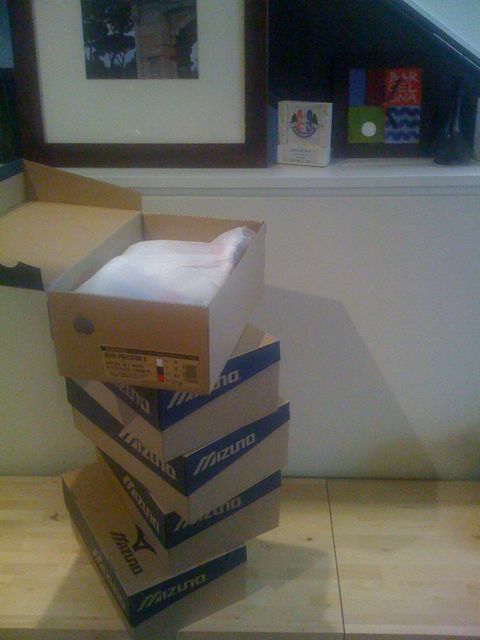 Today I went to the Rogue store to pick up my five pairs of Mizunno size 9 percisions. I posted earlier about the Nike Air Zoom Hayward 3 and how Nike isn’t making them anymore. I’m off on a vacation and wanted to get a pair to walk around in, my current running shoes have 250 miles on them and they don’t just look like they do but they smell like they do. So I went to the Rogue Equipment store yesterday during the happy hour to pick up the gray pair, well they didn’t have those in a size 9 or 9.5 😉 We could have ordered them but the likelihood of getting them would be low I think and I’m leaving tomorrow on vacation. 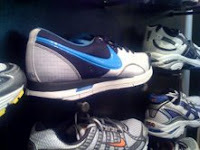 I did end up getting the blue/white ones. They look a little hipper than the gray ones, which can be good and bad, but just as comfortable.